QPHY-MIPI-DPHY enables the user to obtain the highest level of confidence in their D-PHY interface. Due to the high level of variability in D-PHY measurements it is important to measure a large number of cycles. By measuring a large number of cycles in a very short period of time the user can be more confident that they are catching the true maximum and minimum points for their measurement. 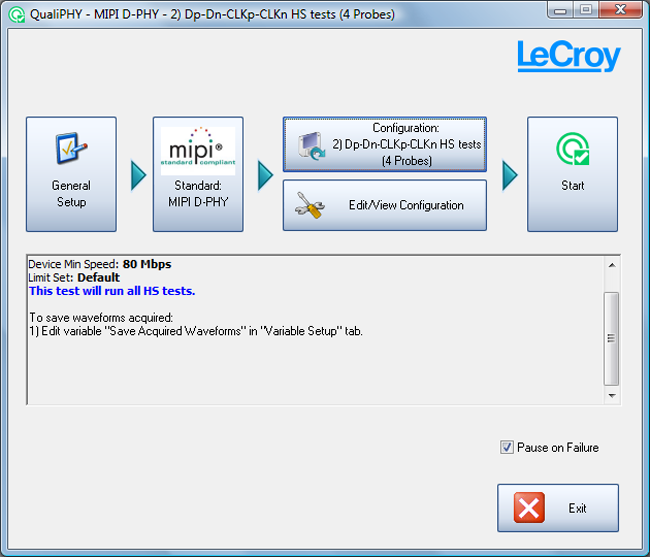 The Teledyne LeCroy QualiPHY platform provides an easy to configure user interface, allows for custom test and limit selection, displays connection diagrams to the user to ensure proper connectivity, and generates a comprehensive test report. In addition, all of the waveforms tested by QPHY-MIPI-DPHY can be saved to easily share information or rerun the tests at a later time. Additionally, QPHY-MIPI-DPHY will display and record the worst case instance of the test that is being performed. This worst case instance will be zoomed and captured in the compliance report. 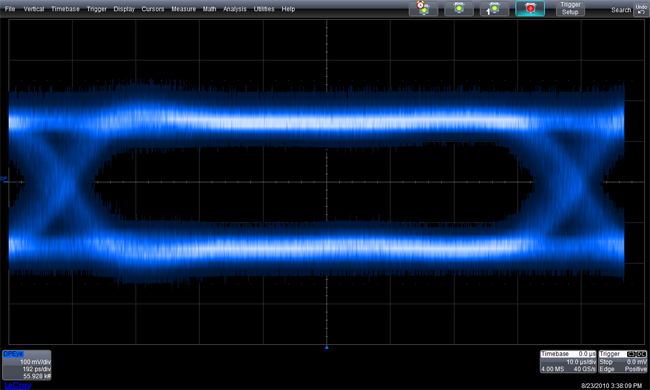 In addition to automated characterization of MIPI D-PHY signals, QPHY-MIPI-DPHY also enables powerful debug capability for MIPI D-PHY signals inside the oscilloscope. The integrated MIPI D-PHY Debug utility and decoders are the perfect combination for identifying the root cause of compliance failures. Although there is currently no official compliance program for MIPI D-PHY signals, it is highly recommended that devices are tested against the limits specified in the MIPI Alliance Specification for D-PHY. For debug purposes QPHY-MIPI-DPHY will create the single-ended and differential eye diagrams for the clock and data high-speed signals. Although there is no formal eye diagram test required by the specification, these eye diagrams make it possible to gain quick insight into signal quality of the clock and data lines. The LP tests verify that the low-power signals' electrical and timing characteristics fall within the required compliance limits. These tests are performed on an Escape Mode sequence. Typically an Ultra Low Power State (ULPS) entry command is used but other sequences can be used also. The HS tests verify that the high-speed signals' electrical and timing characteristics fall within the required compliance limits. These tests are performed on any data capture that contains multiple high-speed bursts. These include tests performed on the data signals, the clock signals and also tests performed that validate timing parameters between the clock and data lines. 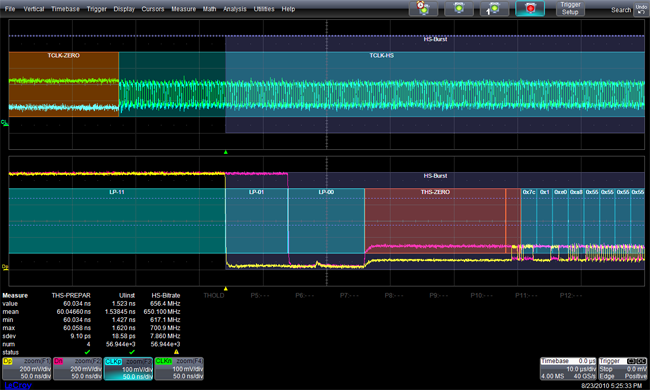 The MIPI D-PHY decode is the ideal tool for powerful system level protocol debug as well as problem solving for signal quality issues. The D-PHY decode solution adds a unique set of tools to your oscilloscope, simplifying how you design and debug MIPI D-PHY, CSI-2 and DSI signals. MIPI D-PHY decode uses color-coded overlays on various sections of the protocol for an easy-to-understand visual display. Depending on the time base or the amount of zoom, the decode information is condensed or expanded to better assist in understanding events during short or long acquisitions. The D-PHY D solution concentrates all your information in one place. 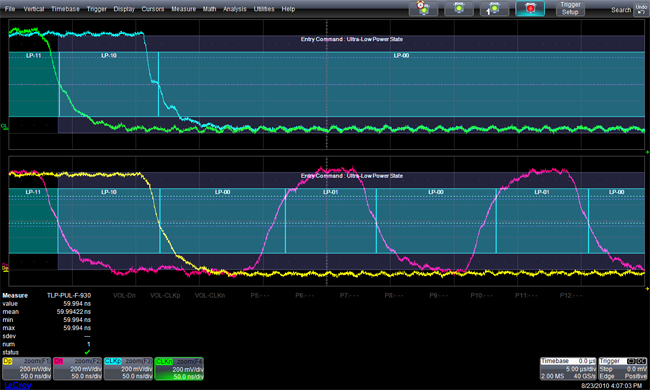 Viewing the application layer of D-PHY signals on top of the physical layer provides a unique view that bus analyzers cannot. 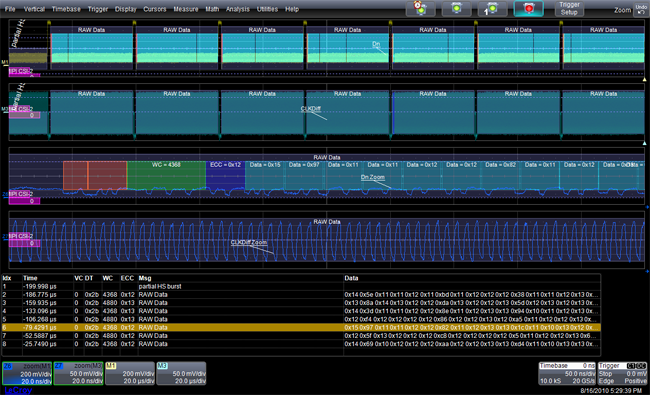 A full suite of amplitude and timing measurements can be applied to debug physical layer issues that may not be apparent in a protocol view.